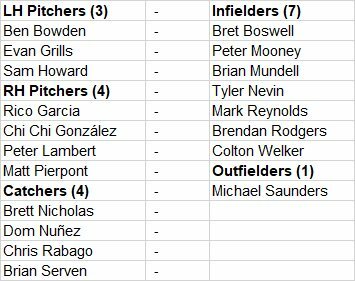 The Rockies have invited 19 non-roster players to big-league spring training. But it’s not like a lot of introductions are needed. Fifteen of the 19 players have been in the organization, including first baseman Mark Reynolds, who returns after two years in Washington, and catcher Chris Rabago, who was a waiver claim by the Yankees late last season, but re-signed with the Rockies after being given his release in the off-season. The newcomers include outfielder Michael Saunders, who has seven years and 80 days of big-league experience, and Chi Chi Gonzalez the prize pitching prospect in the Rangers system. The Rockies also have invited four of their top 10-ranked prospects – No. 1 shortstop Brendan Rodgers, No. 4 third baseman Colton Welker, No. 5 right-handed pitcher Peter Lambert and No. 10 first baseman/third baseman Tyler Nevin. Pitchers and catchers report to Salt River Field, the Rockies base for spring training, next Thursday with the position players scheduled to show up Feb. 18.